Our kitchens are equipped with everything a new, aspiring or experienced culinarian needs to learn and create. 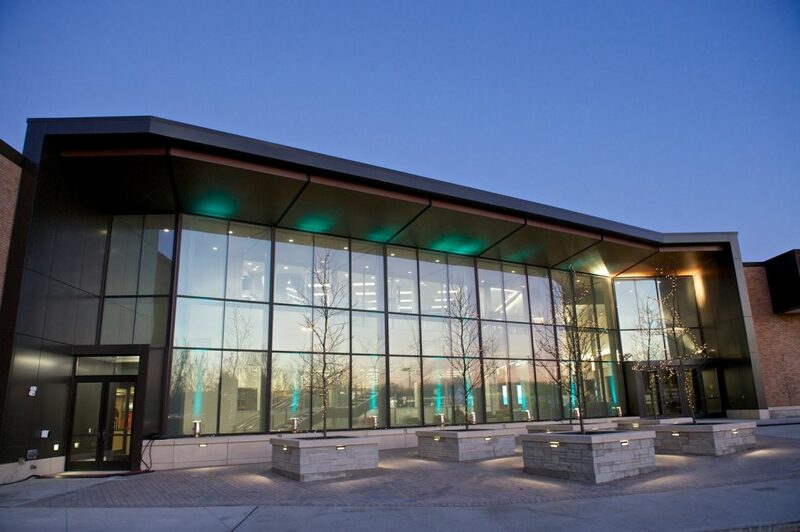 This large, first-floor kitchen is the main training stage for advanced culinary arts students learning Advanced Food Service Production, Global World Cuisine, Farm to Fork and is transformed into the popular Sage & Seed Restaurant. The kitchen is built to convert into multiple industry workshop settings and is equipped with top-of-the-line heavy duty cooking equipment. 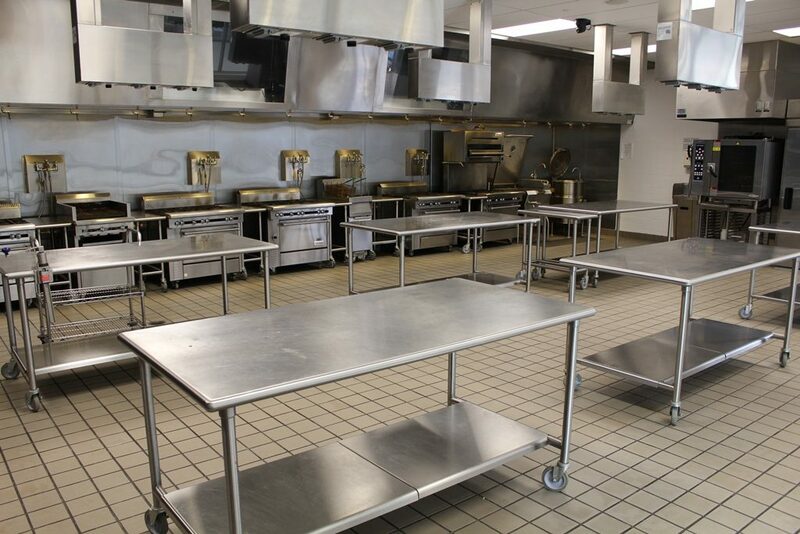 This space is also primary training kitchen used for the Culinary Arts Institute’s cooking classes for the community. 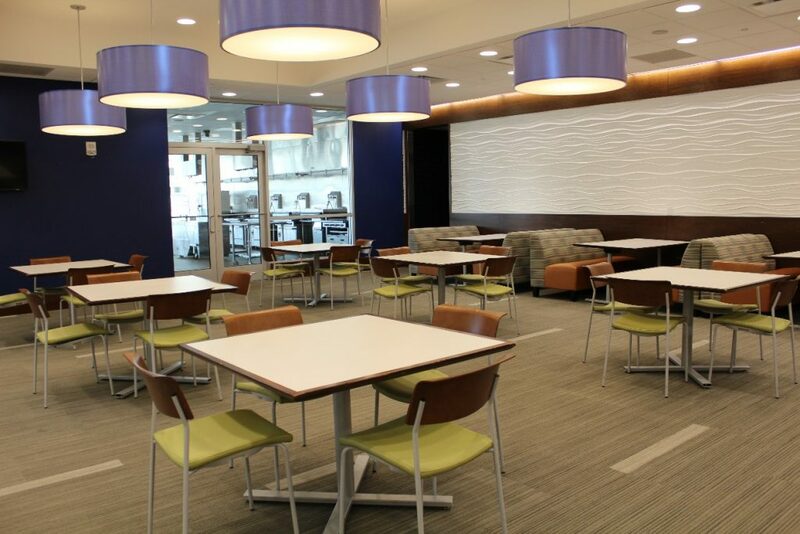 The dining room space is easily transformed to accommodate a variety of seating styles for events ranging from casual to business settings. The dining lab is transformed during spring semester into the elegant Sage & Seed restaurant where LCCC’s own Culinary Arts Students prepare and serve some of Lorain County’s finest culinary delights. 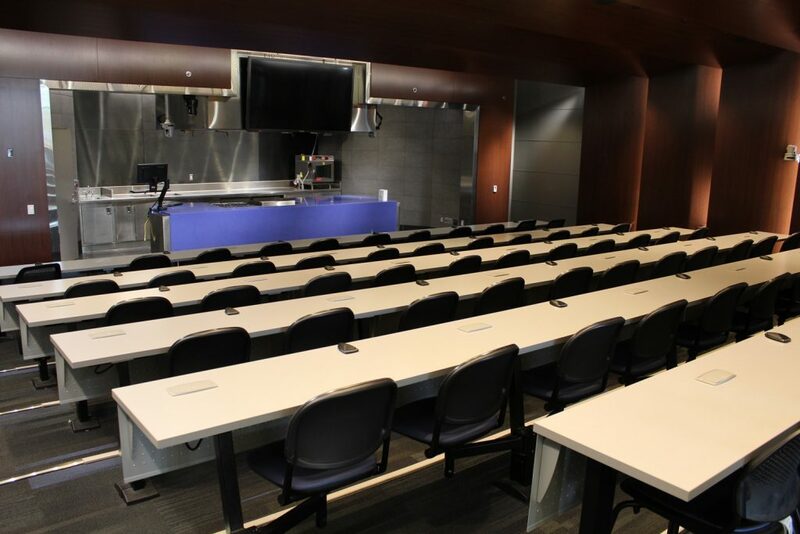 This spectacular room offers excellent viewing for kitchen demonstrations and is home to the culinary arts program’s televised cooking shows. The room offers theater seating with station microphones, creating an engaging experience between the presenter and guests or students. This state-of-the-art pastry and bakeshop lab is the training kitchen for our Introduction to Baking & Pastry and Advanced Bakeshop courses. 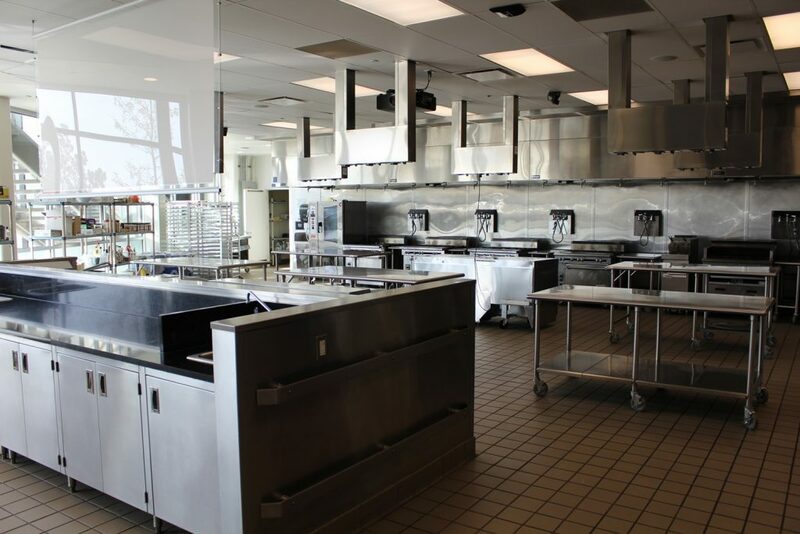 This space is the main stage for all pastry and bake related Culinary Arts Institute courses. The Bakeshop is also a training center for the American Culinary Federation Pastry competitions. 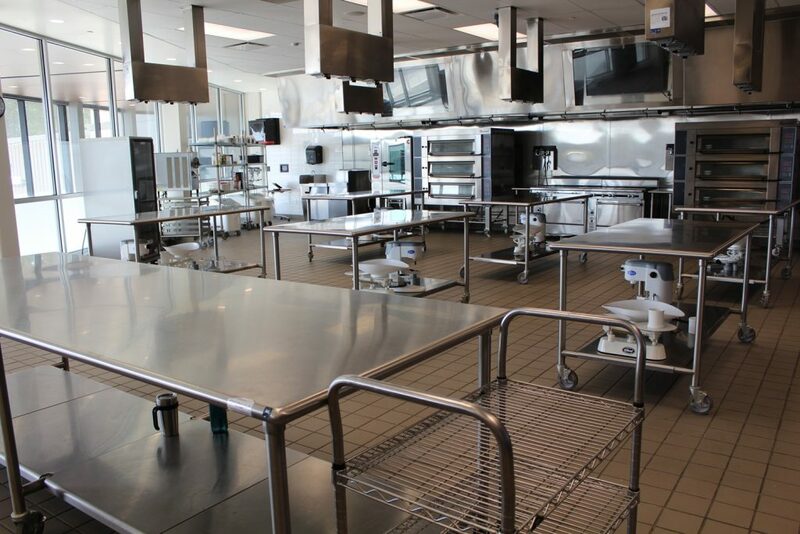 This second floor production kitchen lab is where students begin their foundation training in courses of studies related to Purchasing & Product Identification, Fundamentals of Food Service Production and is also the training kitchen for American Culinary Federation competitions. Our team of culinary experts are also available to help you plan a custom kitchen build-out for your new or existing culinary business and can offer our kitchens as rental space while you plan and build your next adventure.